Forum Index > Historical Arms Talk > Teutonic sword with Jerusalem cross in pommel? Posted: Fri 26 May, 2017 2:18 pm Post subject: Teutonic sword with Jerusalem cross in pommel? 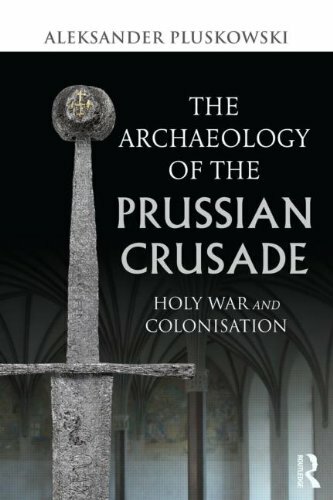 In "The Archaeology of the Prussian Crusade: Holy War and Colonisation" by Aleksander Pluskowski, he mentions a 14th century hand and a half sword with a Jerusalem cross inlayed in pommel found in river Tina. The sword was supposedly published by Chodynski in 2003 (I don't know the title of the work). Have anybody seen the photo of that sword? I would also welcome photos of other swords with Jerusalem cross inlay in pommel or the blade. Thanks! Do you think it'st he sword photographed on the cover of the book? Btw, the article does show another sword from Hungary with real Jerusalem cross inlayed into blade.